Erg, is there anywhere worse than the London Underground in a heatwave? It's like an entirely different world down there: a hostile micro-climate full of semi-naked Londoners stress-sweating onto one another. The air isn't only thick with pollutants and chemicals, there's barely any of it left for you to breathe thanks to the many fleshy bodies squashed onto the carriage and / or platform. Sadly, it doesn't matter how chic, cool and collected you were sat in the beer garden with your glass of wine. When the time comes to travel anywhere at all, you'll immediately look and smell as though you've spent three days crawling to your destination with a ham on your back. It is the worst thing about living in London. But we have the secrets to coping: these are the things you need whenever you attempt to travel across London this summer. Growing up, it seemed that every London mother's mantra was: 'it's rude to stare'. And yet, take yourself on a quick trip on the Northern line, and you'll discover a whole subsection of Londoners who either don't know – or don't care – that it's frankly unnerving to have a stranger eye-balling you for an entire journey. Deal with the oglers with a pair of stylish dark sunglasses. We're currently coveting these from Joseph's new collection of eye-wear but if these are a little too pricey for you, these cat-eye sunglasses from &OtherStories have been all over social media. Our beauty editor always travels with Coco Shambhala's Invigorate Balm, which comes in a handy on-the-go roller applicator that releases an intense hit of reviving eucalyptus, peppermint, lavender, and geranium, that clears the mind and uplifts the senses when you're stuck in the sweaty and often smelly tube. Last year, TfL released a map for people suffering from claustrophobia and anxiety, helping them to avoid long stretches of underground tunnel. But everyone will have had a moment of panicky discomfort, when a carriage full of people comes to a sudden halt (bodies being thrown around every which way) and languishes in the dark and heat forever. For moments like this, when it can be hard to breath calmly, we like to pop a Rescue Remedy Melting Pastille. Try holding it in your mouth for a few minutes, and letting the four drops of rescue essences dissolve on your tongue. These beautiful Muji fans are everywhere at the moment, so channel your inner eighteenth-century lady of leisure and flutter yourself cool as you hurtle through the underground. If the idea of manually fanning yourself sounds like too much energy to be exerting, you could buy one of these 'silent' handheld electric fans. If you're really struggling with the heat and the crowds, spend just three minutes listening to this mindfulness breathing space episode from mentalhealth.org (you can also find it wherever you normally download podcasts). You can listen standing up, and with your eyes open – but bear in mind that the podcast will ask you to consider your surroundings and feelings, so beware of that if you think it will be triggering. If you want something to accompany you for more of the journey, The Mindful Podcast is great, and has as exercises either ten or five minutes long. Alternatively, check out The Tapping Solution, which you can listen to on Stitcher, and learn all about the holistic healing technique that involves tapping your fingertips on specific points of the body to calm the nervous system. Please leave your copy of Infinite Jest at home. It's too big, you won't have enough space to pull it out and read it, and then you'll have to lug it around with you for the rest of the day. What you need to accompany you on your travels is a light short story that you can get into for those few minutes you're whipping between stations. Penguin have released a collection of classic short stories in an attractive light blue, and we recommend picking up a few of those so they can be slipped into your purse / pocket when you leave home. 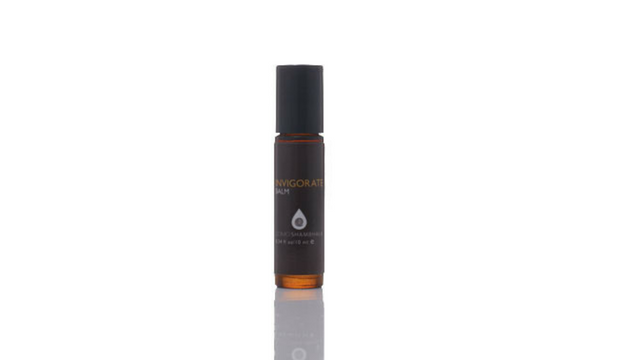 Our absolute favourite facial mist is the Queen of Hungary spray by Omorovicza. Rose scented, and both purifying and hydrating, the toner was apparently inspired by the Queen of Hungary Water; the world's first known perfume made for Queen Elisabeth of Hungary in the 14th century. Refreshing and absolutely non-greasy, spritz a bit of this sweet-smelling, cooling face mist and you'll be able to keep it together on the central line at 8am. We're also in love with this aloe and rosewater facial spray from Beauty Bay – which does a similar thing, and it's only £11. So obvious, so easily forgotten – but do try to bring water with you when you travel underground. Avoid buying a plastic bottle of water from Boots on your way (they're so bad for the environment) and instead invest in a beautiful bottle you'll be proud to be seen with. We love this £15 hip bottle from Harvey Nichols which comes in loads of colours so, you can match it to your outfit. Ignore the naysayers, bum bags are one of the biggest trends for 2018 – and thank goodness because they're perfect for travelling on the tube. Forget rummaging around in your rucksack, or trying to locate your oyster card at the bottom of a massive leather handbag. You need something small, neat, easily accessible and effortlessly chic. The Gucci bum bag is the one everyone's into at the moment, but we also like the suede belt bag from Theory. Read more about them here. Try not to think about how many germs you're encountering on the tube every morning, instead just kill the lot of them. We think the best hand sanitiser is this rinse-free, non-alcoholic hand wash from Aesop, with its 'purifying and hydrating' properties, but you can always pick up a normal one from Boots if you so wish. It's far too hot to have your hair down, you need as much air blowing against as much of yourself as you possibly can. Tie your hair up with this lovely invisibobble. OK now, are you ready? Into the tube we go.